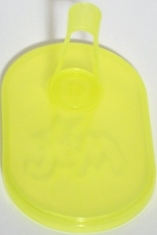 Stock # (US) #4205/#4010 Asst. 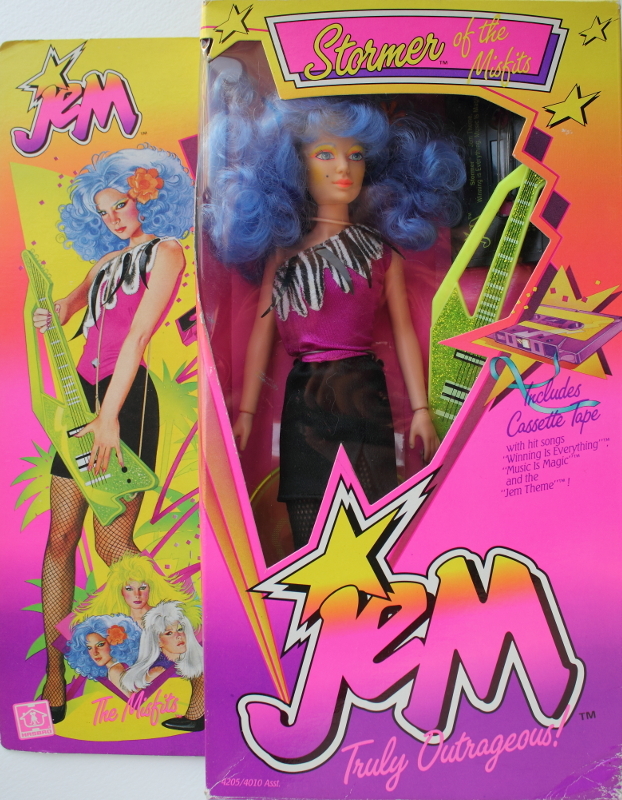 Hasbro package contents listing 12 1/2" doll with stage fashion, musical instrument, pumps, hairpick, cassette tape, two bracelets and figure stand. 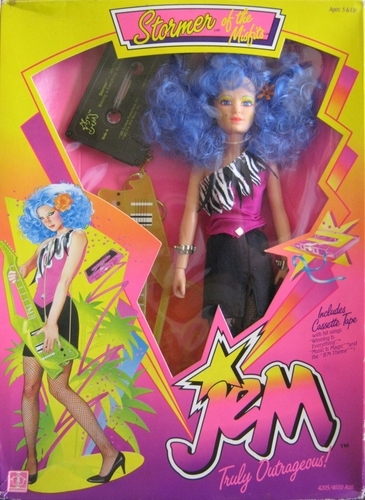 Stormer was released both years, the packaging and guitar being the main differences between the two. 2nd year Misfits seem to be limited to ones marked "Made in China" - BUT, not all Made In China Stormers are 2nd year dolls. She had been named Roxy and Rue at various points in development. *doll shown in this guide is Hong Kong made, but the box information and outfit are Chinese. More Skip here for a listing of other depictions of Stormer (cartoon, prototypes, catalogues, etc). 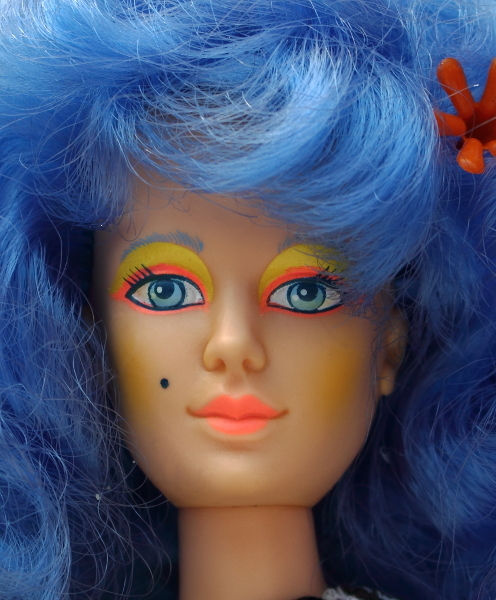 12 1/2" doll; Caucasian doll with long curly dark blue hair. 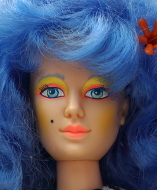 Hair texture and to a lesser degree her make-up varies, go to the Misfits/Holograms doll comparison page for more information on that. 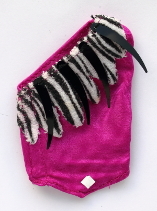 stage fashion (one-shouldered tank top); a plum spandex trimmed with a wavy-hemmed velveteen zebra print. Sewn to her shirt are four black mylar "claws" and a small square silver mylar sticker (like those on Roxy's belt) goes on her waist. 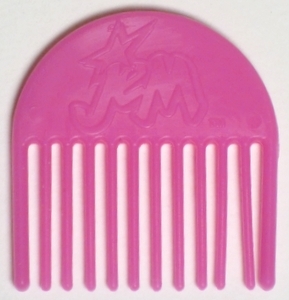 It velcros up the side. 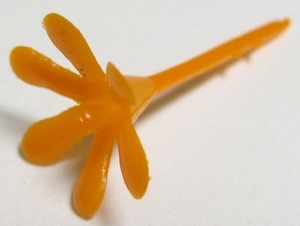 These claws are also very easily damaged and are often found broken off or missing completely. 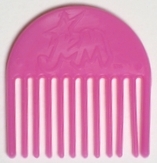 The sticker as well, is just a sticker, and is almost never found on a loose Stormer. Pizzazz's dress uses these fabrics as well. stage fashion (skirt); Elasticized-waist black satin-like mini with a slit up the front. stage fashion (tights); Black closed-weave fishnet tights. Some Second Edition Stormers (like David's UK one) can be found with black lace tights, like those from You Gotta Be Fast. One contributor mentions that her lace tights doll came with a first edition (clear, not milky) stand. stage fashion (flower); Plastic hair flower. 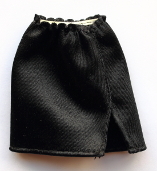 difficult to find these on loose dolls. 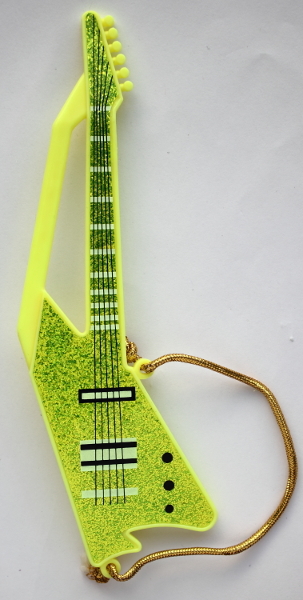 musical instrument; Yellow guitar with a gold cord. First edition doll (top) has an opaque body with a glittery sticker. Second edition (bottom) has is translucent with sparkles in the plastic. This unique body design is copied from a real guitar, the short-lived (1983-1986) Roland G-707, which combined aspects of an electric guitar and synthesizer. Very '80's! 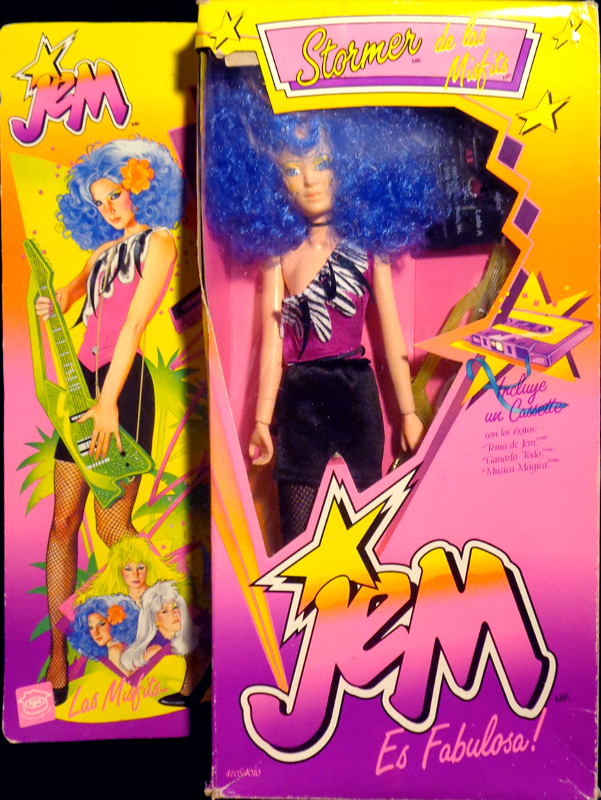 Incidentally, the Stormer doll is usually shown holding the guitar upside down. The "handle" is meant to be on the top, not the bottom. Mexican Stormer came with a greener version of the 2nd edition guitar. 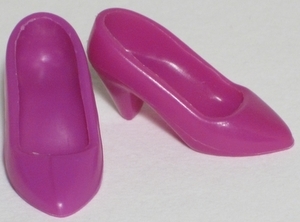 pumps: straight cut dark red-violet pumps, came with my H-22/China-made 1st edition doll. cassette tape; Black with green lettering on the label. 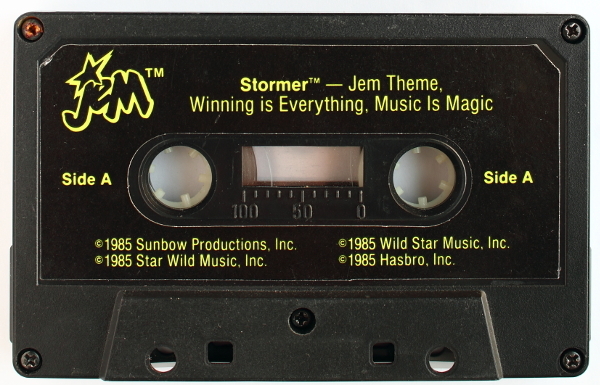 Titled "Stormer"- comes with the songs "Jem Theme," "Winning is Everything", "Music Is Magic." 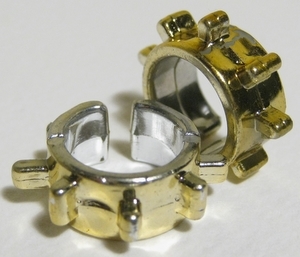 two bracelets; gold spiked "Misfit" bracelets. 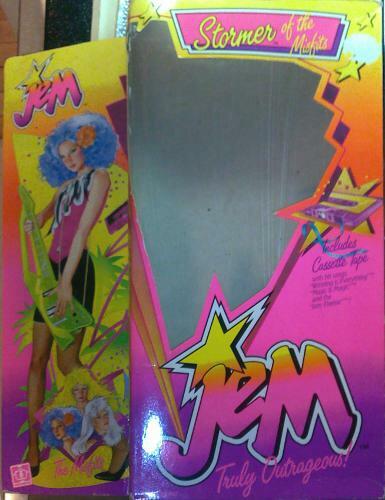 Pizzazz, Stormer and Roxy (first and second editions) came with these. 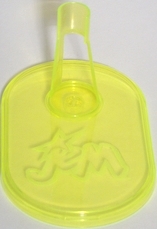 figure stand; First edition stand is clear fluorescent yellow (top). 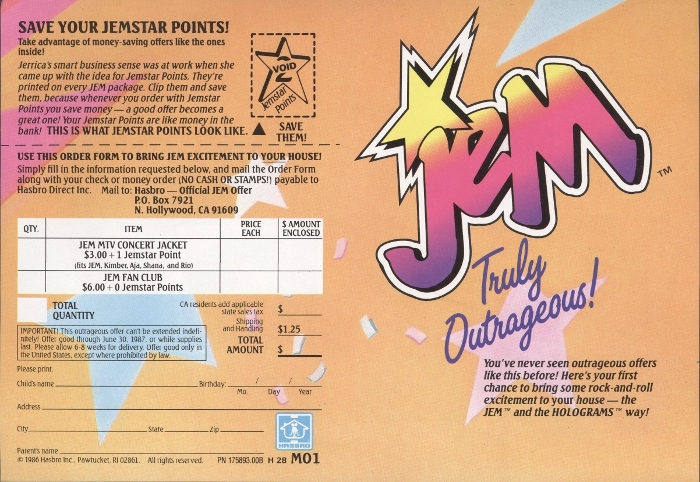 The first editions of Pizzazz, Stormer and Roxy each came with one. Second Edition stand is milkier. 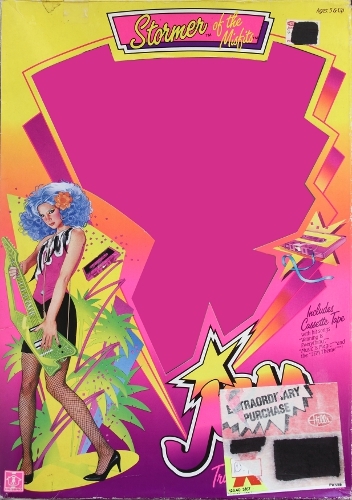 Clash and the second editions of Pizzazz, Stormer and Roxy each came with one. 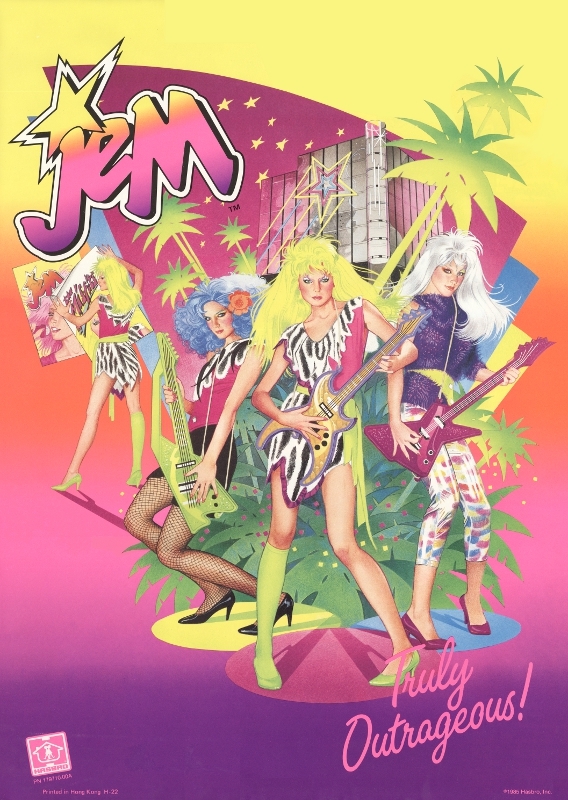 One 2nd edition Stormer with the lace tights came with a first edition stand. Packaging Variants: A listing of the packaging that Stormer can be found in, that I know of, so far! You may also find it interesting to find out what "H-22", "H-32", and "H-44" means. Anything in Italics I haven't actually seen but have good reason to believe exists. If you have any photos or information/corrections to share, I'd love to hear about it! 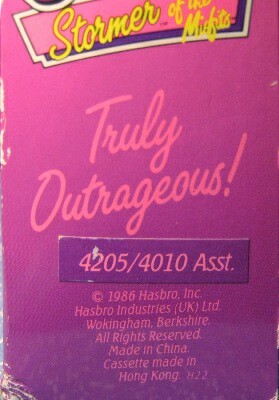 US Issue, 2nd Year flat front box; 4205/4010 Asst./© 1986 Hasbro, Inc. Pawtucket,/ RI 02862 All Rights Reserved./Doll, doll stand, accessories/made in China. H22/Cassette made in Hong Kong. 1986 US Hasbro Toy Fair Catalogue it looks like the same doll is also modeling the Smashin' Fashions. 1987 US Hasbro Toy Fair Catalogue Looks pretty much how the produced doll looks, I can't see any obvious differences. 1987 France/UK Toy Fair Catalogue (French Shown) She is wearing yellow shoes, her hair looks like the curlier variation. The Misfits in Topolino Magazine Issue 1606, September 7, 1986 Missing her hair flower. Her hair flower is white! Lip colour looks a bit darker. 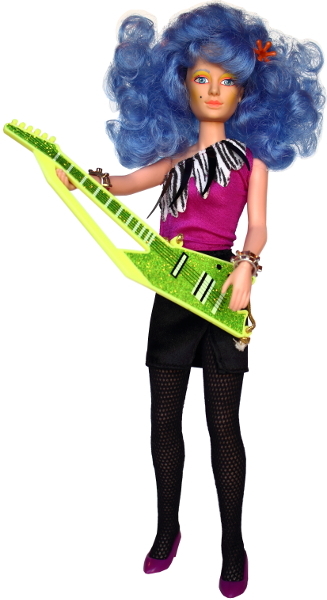 Very early prototype of Stormer (originally named Roxy). From Moggygoddess' photos. Completely different doll style, outfit and make up has various obvious differences. More closely resembles Stormer's first incarnation on the cartoon, as this was a photo that Sunbow would have used as a source. She is shown with a white hair flower, the zebra print on her top looks more sparse, has the silver sticker on her skirt, only has one bracelet. Credits: Thanks to Molly, Dennis and Fredo for the information on Stormer's yellow show variant. Thanks to David for his photo and info of the UK 2nd edition Stormer. Thanks to Janet for the 1st Edition Box w/sticker photos & 2nd edition guitar photo.